Newly revealed video from official Syrian TV shows Cohen after the hanging, and his body being taken down from the gallows. 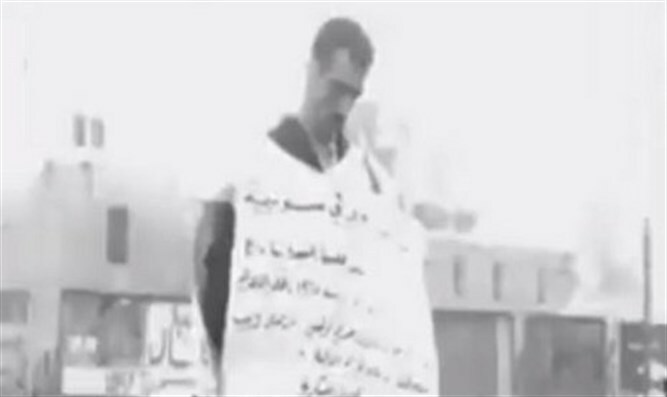 In a rare video, Israeli spy Eli Cohen is seen after his hanging and while his body is being taken down from the gallows. The video contains footage shot by official Syrian television. The footage was captured by Syrian rebels during the civil war and given over to Israeli hands. Cohen joined Israeli intelligence in May 1960. He signed up with Unit 188 of the Military Intelligence Directorate, which later became part of the Mossad. The unit then became known as the vaunted "Caesarea" unit, the "special operations" unit. In his work for Caesarea, Cohen masqueraded as an Arab in order to facilitate Jews from Egypt making Aliyah to Israel. He himself had only moved to Israel when he was 33, three years before he was drafted into intelligence. In 1961, Cohen was already married and a father to one daughter. He was sent to Argentina, where he assumed the identity of a Syrian exile working as a merchant. Cohen built connections with senior Syrian officials over the next few years and gathered valuable information for Israel. On the 18th of January, 1965, Eli Cohen was captured. Three Syrian intelligence officers, led by Colonel Suweidani, head of Syrian intelligence, broke into his apartment. Cohen was hanged in Marjeh Square in Damascus, leaving a wife and three children in Israel. "I ask of you," he wrote to his wife Nadia, "don't mourn for the past, but rather look to the future."